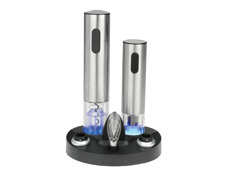 1.Blue light shines when in use or being rechargred 2.Open 30 bottles per fully charged. 3.Stylish stainless steel look. 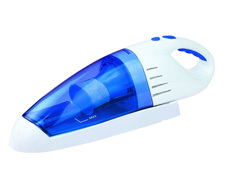 4.Rechargeing base and foil cutter included. 5.LED Lighting. 1.Best Seller in USA ,rewarded by Consumer Report in 2008. 3.Light illuminates ties for easy selection in dark closet. 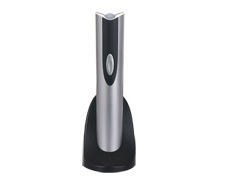 3.Electric wine opener easily opens up to 30 bottles fully charged! 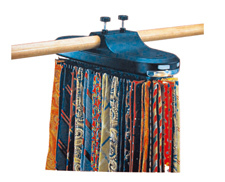 4.Strong power for efficient cleaning. 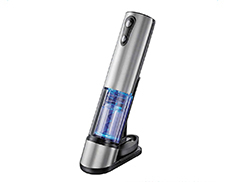 How to use the car vacuum cleaner? What products are you manufacturing? How to Use Electric Wine Opener? Information about "Kelitong information "
How many years the wine opener can be used? How to use the wine opener after removing the foil cover from the bottle? What’s the foil cutter used for? 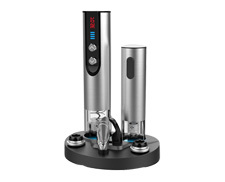 Why KLT is the leader in Electric Wine Opener in the world?